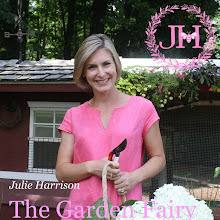 Julie The Garden Fairy: Amaryllis and Orchids and Topiaries, Oh My! Amaryllis and Orchids and Topiaries, Oh My! Not a single day goes by without some sort of gardening- 365 days a year. Gardeners always need to stay two steps ahead, prepared for the next task, at the ready to plant something new, or address that sneaky pest. As a Mom, I also try to stay two steps ahead. Preventing the next melt-down, packing enough goldfish and emergency diapers, just in case. So, if my math is correct, that puts me about 4 proverbial steps ahead in Gardening and Mommying and 4 steps behind in a few other things in my life. I can hardly catch my breath; forget keep up with my blog! Enough whining- I really L-O-V-E all of it! Yesterday my almost two year old daughter was standing in the living room trying to look on the bottom of her left food. I asked, "Is there something on your foot?" "Toes!!!!" was her reply. She cracks me up! Good, clean fun with shaving cream! There is a lot blooming in the gardening department around here- My Amaryllis continues to impress- another bud emerged this week! These three bulbs have been blooming for over three weeks and they are not done yet! Two of my Phalaenopsis Orchids are blooming (again!) My southern facing windows are proving to be Orchid heaven. And, here is a last minute valentine topiary idea. Click on the link below to watch me make it. It's also a great way to give an extra Ivy or Philodenron if you have that and an extra coat hanger lying around the house. Watch this clip from WFSB's Better Connecticut to see how to make it- Click HERE. I won't tell you waited until the last minute!